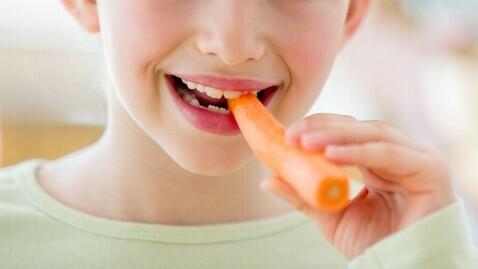 Have you been trying to get your kids to eat healthier? Parents today are inundated with advice about healthy eating. Is it any wonder we are unsure of what we should serve our families? The common concern is raising healthy kids in a world full of unhealthy food choices. Kids are more likely to eat better when they eat with their families, but no kids eat all meals at home, and when they leave the house, temptation is everywhere: fast foods, soda, chips, cookies, ice cream and candy. To add insult to injury, our children are bombarded daily by luring ads and marketing strategies that encourage them to whine and plead for foods that are less than healthy. "Look mom it's Sponge Bob!" "I want the cereal with Scooby Doo on it!" Sound familiar? This is not going to change, so what we need to do as parents is take the animated bull by the horns. I have taught my boys from day one that their favorite character is on packaging, fast-food restaurant windows, in a "kids meal" or anywhere, else just to get us to buy the product. By the time they were about 4 years old, they 'got it.' They still want this stuff but understand that it isn't the best choice - so it's always in moderation. We all know it's not easy to get kids to eat healthy, but you can't give up. The choice of what to eat and drink when we are not around is left to our kids' young, sweet and fat- craving minds, and believe me, as a mother of two school-age boys, they make a bee line for the junk. So how do we teach them to choose the right foods when they are left to their own devices? The only thing we can do is start at home. Discuss how they can make better food choices away from home and listen to their concerns and desires. Let them know you respect their opinions but are worried for their well-being, both today and in the future. The benefits of healthy eating in childhood and adolescence go beyond looking good and managing one's weight. Many illnesses can be prevented through proper nutrition: diseases like diabetes, cardiovascular disease and certain cancers, to name a few. Research has found that heart disease begins silently in childhood, and the manifestations appear in adulthood. Children need a nutritionally balanced diet that supports optimal growth and development, and provides enough energy for physical activity. For optimum nutrition, choose a variety of brightly colored fruits and vegetables, low-fat dairy products, beans and legumes, lean meats and whole grains. The quantity of food consumed is as important as the quality. Try to familiarize yourself single-serving portion sizes. There is no need for continual weighing and measuring. Just weigh and measure a few times, and eventually you will be able to "eyeball" the amount that makes up a serving. 1. Teach your kids about nutrition from a very early age. Even though you think they don't understand, they do, and it sinks in. Talk to them. "This carrot is loaded with vitamin A, which is so good for your eyes." "Avocadoes have good fat in them that helps your brain." 2. Go through your refrigerator, pantry and cabinets and determine what positive changes you could make. Get everyone involved in the process. As you become more and more aware of which foods are unhealthy, you can reduce the amount of those foods in your diet and within reach. Keep healthy snacks on hand in proper portions. Good options include fruits and veggies, smoothies, low-fat cheese, yogurt, ice cream, frozen fruit juice bars, whole grain crackers and so forth. 3. Involve kids in meal-planning and grocery shopping. Take them to the local farmers' market and pick-your-own farms. This helps them learn about different foods and makes them part of the decision-making. Children look to us as role models, and if they see us trying to become healthier, it will likely spark a desire for change in them. 4. Make it fun! Get the kids in the kitchen whenever possible, cooking, peeling, picking leaves off of herbs, chopping (with age appropriate knives of course), anything that gets them in on the action. Ask them what they like and talk about specific foods that are good or not-so-good for them. Come up with creative dessert ideas and whip it up with them. 5. Be persistent but not insistent when offering healthier foods. Many parents give up a little too easily when it comes to trying out new foods with their kids. It can take eight to 15 exposures before a child warms up to a new taste. Henderiks is a registered dietitian, founder of Dianehenderiks.com and a "Good Morning America" health contributor.